Iron Philips Amway: Philips PerfectCare Aqua Steam Iron GC8625 + FREE HUGE IRONING BOARD! 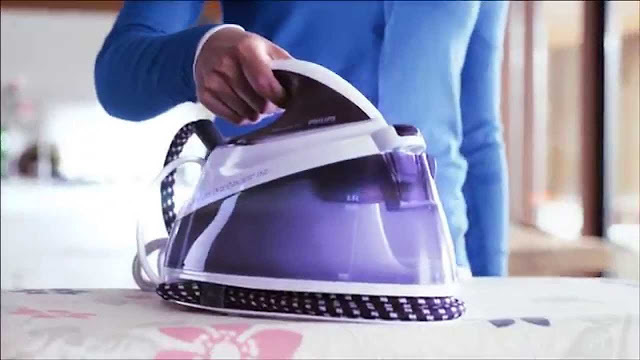 Philips Perfect Care Aqua Iron represents the epitome of hassle-free ironing where no temperature setting is required. Just fill up the water tank, wait two minutes and start ironing. Philips Perfect Care Aqua Iron comes with OptimalTemp Technology – a perfect combination of temperature and steam for all ironable garments. Purchase of the Philips Perfect Care Aqua Iron also comes with a free Philips Ironing Board and DVD, worth RM419. Has continuous steam up to 120g/min and steam boost 300g/min. Up to 5.8 bars of steam pressure for fast ironing. Easy De-Calc provides a hassle-free and effective anti-scale system (comes with lock). It takes only two minutes to heat up. Carry lock function that helps secure the iron to the base station. Fill the water tank with water, and wait for the iron to heat up. It will take approximately two minutes for the iron to be ready. Plug directly into the power source. Do not use extension cord. Not to be used by children without supervision. Resepi Periuk Noxxa: Iron Philips Amway: Philips PerfectCare Aqua Steam Iron GC8625 + FREE HUGE IRONING BOARD!